So, Iowa’s unofficial food is something called a loose meat sandwich. Some call it a “maid-rite”, but yes you read correctly – LOOSE meat sandwich -something between a hamburger and a “joe” without the “sloppy”. Weird, right? We thought so too. But, we wanted to keep an open mind. They’re made differently throughout the state, so we tried a couple. Here’s the review. 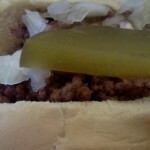 I first discovered this loose meat sandwich with an article my former co-worker sent me – 50 Best Diners -but I don’t remember the publication. I made a note in our spreadsheet of this unusual sandwich and it was either the New York Times or USA Today that suggested George The Chili King. Since we were in Des Moines already, we added it to our list for the day. After working up an appetite with visits to the Pappajohn Sculpture Park and Gray’s Lake, we were ready to eat. We found the location pretty easily. The restaurant looked like it needed a fresh coat of paint and the “I” in chili was missing, so today George was the “chil” king. But a little wear doesn’t scare us off. It used to be a drive-in. It still has the signs that say turn on your lights for service – though we’re pretty sure that’s just a remnant of the old days. Inside, the restaurant seats about 16 people with the capacity to seat more at the picnic tables aligned beneath the parking port. We found two seats at the bar and attempted to talk with the waitress who was very thin and had several teeth missing. We asked about the loose meat sandwich and she said here it’s called the beefburger and the original comes in a hot dog bun with chili, mustard, onion and a pickle spear on the top. We ordered one to split and fresh onion rings (made at the moment you order from REAL onions). Obviously we were trying to keep our vegetarian stomachs in check with only half a sandwich, though we were surprised when we each got a hot dog bun-sized sandwich cut in half. The meat was salty and would have been bland with out the other toppings and the chili was not the kind of chili I was used to. The oinion rings were good with a light batter and very crispy. But, overall we walked away not as impressed with the loose meat sandwich. Our friend Cindy mentioned earlier this week that if we were in Bettendorf (suburb of Davenport) we had to stop at Ross’s for their “Ross burger”. They are also known for their “magic mountain” which is texas toast, meat, french fries, cheese sauce and raw onions. Oh, boy! A bit similar to a “horse shoe” that we were tricked into eating in Springfield Illinois, repackaged with a sexier name. The “Rossburger” came out wrapped in wax paper, interesting. I opened it up an cut it in half – loose meat was spilled out of the sandwich and onto the table making it nearly impossible to split with Kimmer. Okay, NOW I know why it was wrapped up. This sandwich came with ketchup, mustard and pickle. This true sandwich was very good but it just tasted like a burger. I don’t know for sure if the loose meat changed the taste at all but it was good. We tried the Iowa delicacy, twice. It’s interesting and something to try, but really Iowans, isn’t it just a lazy man’s hamburger – press them into patties people. Ross’s Restaurant – 24 Hours! Okay okay Karla! Geez, stop yelling. I was told it was a maid rite by the waitress and our friend from Iowa, so maybe they just consider it that now. And I had to look up the Little Kings, but I do recognize it now! mmmm…. root beer. As for the gum wall, there’s a ridiculous one in Seattle that we’re planning to visit, so I’ll have to send you photos when we get there. Oops! Sorry I was yelling….I just get worked up over my maidrite’s and little kings. I love it that you went to Ross’s! The wax paper is suppose to soak up the grease! You described it beautifuly, ketchup & pickles yummyy!!!! Hope your gut held up with the magic mountain! Thanks for sharing. It’s just like the Springfield Horseshoe – we got “prepped” for it. Thanks for the tip, Ross’s was great!